Restoring Milwaukee's inner harbor, both environmentally and economically, is a top priority in the city's ReFreshMKE sustainability plan. A handful of people want to help jump start the project. The inner harbor stretches nearly 1,000 acres, from just south of the Summerfest grounds down to Bay View and west to South 2nd Street. Three rivers meet in the harbor, the Milwaukee, Menomonee and Kinnickinnic. It’s long been a shipping, rail and trucking hub on Lake Michigan. Bruce Keyes, one of the founders Harbor District, Inc., maintains that one way to reimagine the inner harbor is to bike it. WUWM's Susan Bence biked with Keyes along a maze of dead-end and often dilapidated streets, passing by a spot where people store their boats and then an old scrap yard. “The scrap facility in 2007 was bursting with barges taking scrap metal out," Keyes says. "The economy has changed so that we import more metal than we export. If it’s not going to be utilized in that regard, it seems a shame to see such a large tract of land sitting idle." Over the last few years, he’s challenged his students to envision what the inner harbor could be. “It’s loaded with potential, capitalizing on the fact that it’s waterfront land,” Wasley says. "Ecologically, it has a lot of potential to be a wonderful place to be and also to help the health of the harbor." Wasley’s students have conjured up designs of bubbling fountains and gardens that would absorb storm water. Pedestrian paths linking the vibrant industrial area to residential blocks in the adjacent Walker’s Point neighborhood. Grad student Nathan Cantley tackled the sewage treatment plant on Jones Island, near the north end of the harbor. “My design incorporated creating an enclosure around the current plant; sort of a visual aesthetic of the plant – being less 'sewagey' and more of what comes out of the plant,” Cantley says. His design incorporates a magnificent, rippling rooftop, “that’s made of plastic pillows...that are very lightweight." "But the undulation was meant to reference water is a very big part of the place and it’s also sort of a visual water landmark for the whole inner harbor,” Cantley says. 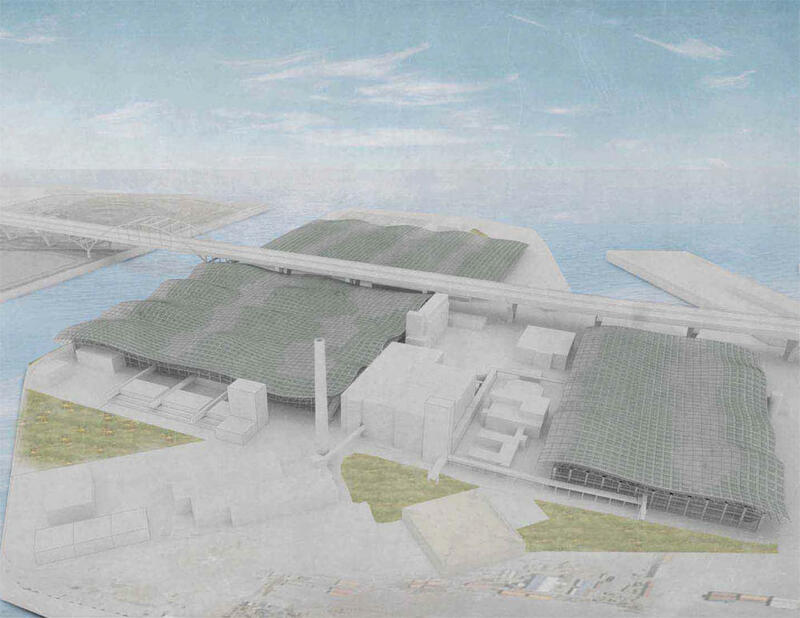 Nathan Cantley's vision of the sewage treatment plant on Jones Island. 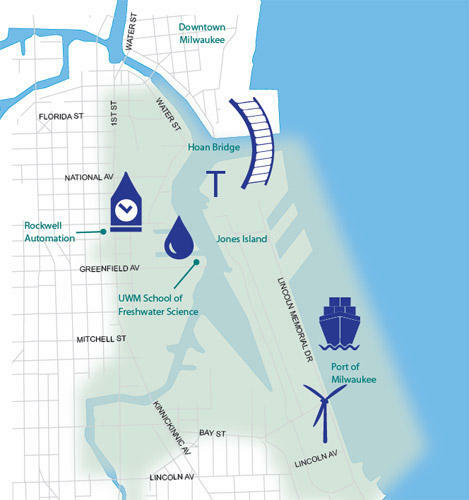 Bruce Keyes points out that if Milwaukee aims to become an internationally recognized water technology hub, it needs a sensational harbor to match. Through Harbor District Inc., Keyes hopes to stimulate excitement and a sense of urgency. He draws inspiration from what the City of Toronto accomplished. “They made a bid for the 2002 Olympics and they didn’t get it, but they were able to redo their waterfront. So you think, if we create that sense of magnitude, what we could actually accomplish,” Keyes says. Milwaukee’s public works Commissioner Ghassan Korban won’t wager how the inner harbor will evolve, but promises it will include a sophisticated storm water management feature. “We will be looking at it in a very innovative, out of the box thinking. We’re going to push the limit in terms of what could we do that is innovative in the city; to make it a unique model project,” Korban says. Small kayak canoe rental company set up shop along Milwaukee rivers estuary. Amid the inner harbor’s scrap yards and coal piles, Korban points out a small business tucked along the inner harbor’s northern edge. “It’s called the Milwaukee Kayak Company. You can take a kayak or a canoe and you have three options – the Milwaukee River, the KK or the Menomonee,” Korban says. Bruce Keyes has done a lot of inner harbor exploring, but says he had not spotted the kayak company. Iris Gonzales says neighbors in Walker’s Point don’t know what’s here either. She says people think of the inner harbor as cut off, “there’s not really access to this place, so it doesn’t have its own character for them, it doesn’t mean something as a space to them." Gonzales is making it her business to draw residents into the discussions about its future. She’s is community engagement specialist with the Sixteenth Street Community Health Centers. “We’ve learned, when we describe that geography, people don’t really understand. And they also really concerned about, or want to know, what is going to happen here – how is it going to impact me, my neighborhood, my block,” Gonzales says. New businesses and residential units are beginning to bubble up in the inner harbor. One of the tasks facing the early waterfront visionaries is to create connections that make sense to Walkers Point and other neighborhoods. The school has evolved since its inception in 1966. Today it is positioning itself as a crucial part of Milwaukee's global water center. 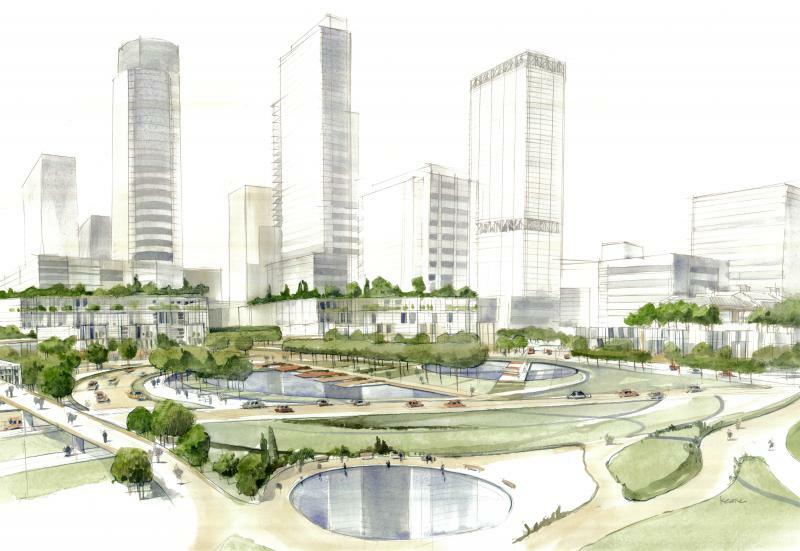 Two architecture professors hope their sketches of how Milwaukee could remake its lakefront generate discussion and more ideas.